For more than half a century, winery and vineyard leaders have gathered in June at the ASEV annual meetings for research updates, to network with friends and colleagues and to learn about innovations that allow them to be more competitive. This year and for the first time, sponsors and advertisers will have the opportunity to reach a unique and diverse client base with focus on the Napa Valley wine region. 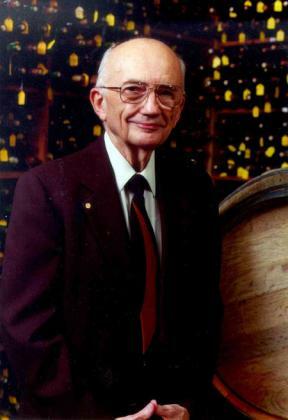 The 2008 ASEV symposium, “Phenolics Substances in Grapes and Wine,” honored Dr. Vernon L. Singleton of the University of California, Davis, for his outstanding and influential career in wine phenolic chemistry. Over the course of four decades that were marked by the publication of more than 220 papers and four books, Dr. Singleton produced a profoundly influential series of works focused on phenolic chemistry. The CD is available to ASEV members for $25. Click here to order today. 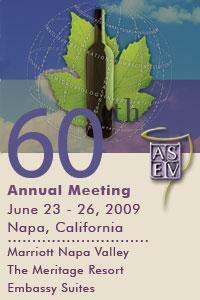 ASEV will celebrate its 60th Annual Meeting by debuting a new venue. Research reports, supplier-industry seminars and themed symposia—all capitalizing on wineries, vineyards and suppliers of Napa Valley will be offered. Immerse yourself in our content-driven program while networking with hosts from vineyards and wineries of this famed wine region. The ASEV Board of Directors recently approved an ASEV scholarship in the name of Mike Vail. 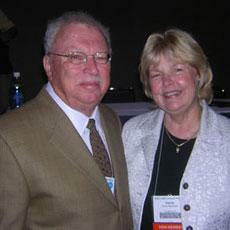 Mike passed away in September and was a dedicated member of the board of directors. The annual scholarship will be awarded to a student pursuing a degree in viticulture. This award is part of the total scholarship funding ASEV grants each year to students enrolled full-time in undergraduate or graduate degree programs in enology, viticulture, or directly related fields of science with an emphasis in these areas. Portland, Oregon, enabled the perfect balance of science and leisure for those who attended the 59th Annual Meeting held in June. Opus One’s winemaker, Michael Silacci (right), officially took reign as president of the ASEV Board of Directors as of July 1, succeeding Past President Craig Rous (left) of Bear Creek Winery. 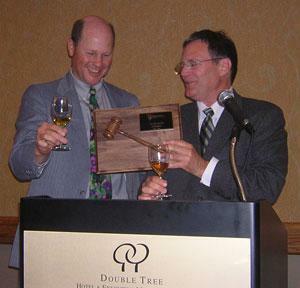 The 2008 Annual Meeting held in Oregon in June hosted the largest crowd in three years. Attendance increased by 15% and the nearly 100 research reports presented reflected a 50% increase over 2007. The Oregon wine industry provided an excellent setting as researchers and wine and grape industry members toured Oregon wineries, learned more about the world’s recognized Pinot noir regions, interacted with well-regarded domestic and international scientists, and had the opportunity to witness a unique slate of sensory scientists from California, Europe and Australia. The American Society for Enology and Viticulture (ASEV) is honoring two industry leaders for their contributions to grapegrowing and winemaking this June at its 59th Annual Meeting in Portland. This year, ASEV’s Merit Award recipient is Robert Steinhauer of California, and Dr. Peter Winterhalter of Germany will present the Honorary Research Lecturer. This year’s American Society for Enology and Viticulture’s (ASEV) 59th Annual Meeting will be held at the Oregon Convention Center in Portland, Oregon, on June 17 – 20, 2008. Key highlights for this year’s conference are the themed Supplier Showcase seminars set for June 18 and 19, a regional winery tour, research reports, including world-renowned experts in enology and viticulture, and the chance to taste local wines at the Pacific Northwest Wine Reception. DAVIS, CA, March 10, 2008…. Labeled “elegant and complex” by the American Society for Enology and Viticulture (ASEV) best paper committee, England’s John C. Danilewicz’s paper, “Interaction of Sulfur Dioxide, Polyphenols, and Oxygen in a Wine-Model System: Central Role of Iron and Copper,” has been selected as the best enology paper published in 2007 in the American Journal of Enology and Viticulture (AJEV). What is open access? Open access refers to publications that are made freely available in the public domain. Recent debate about open access has centered on publicly funded research, such as the publication of medical research funded by the National Institutes of Health. Free access to such publications is consistent with the expectation that taxpayer-funded research should be accessible to the public, whether through the Internet, libraries, and various forms of printed or online material. The Pacific Northwest wine and grape region will be center stage on June 17-20, as the American Society for Enology and Viticulture hosts its 59th Annual Meeting in Portland, Oregon. Key highlights for this year’s conference are the themed Supplier Showcase seminars, regional winery tours, and a taste of the Pacific Northwest, in addition to attending research-based seminars including world-renowned experts in enology and viticulture. “Interaction of Sulfur Dioxide, Polyphenols, and Oxygen in a Wine-Model System: Central Role of Iron and Copper” (58:53-60), authored by John C.
Visit the Annual Meeting section to review program highlights including the Supplier Showcase, daily schedule, information on registration and hotels, travel, and the many attractions offered by the city of Portland. Registration and housing opened on March 31. Please note that the technical abstracts submission period is now closed. The Call for Abstracts is available for reference only. Pre-Registration is now closed. Registration will be open on-site on Friday, February 1 at the Hyatt Regency Sacramento. On-site registration for the symposium and/or the reception and dinner will be offered until sold out. ASEV has introduced this online event in order to serve more of the industry. Access to this type of quality information is now available to those who could not attend this symposium. You will be able to view individual speaker presentations and slides in any order you wish. Scholarships totaling $60,000 have been awarded to enology and viticulture students throughout North America by the American Society for Enology and Viticulture (ASEV). The Society annually awards the scholarships as part of its broader effort to foster the dissemination of critical industry research and science. “These are outstanding and very worthy students who will shape the future of our wine and grape industry in the years to come,” said ASEV President Craig Rous in his introduction of the 20 scholarship recipients. 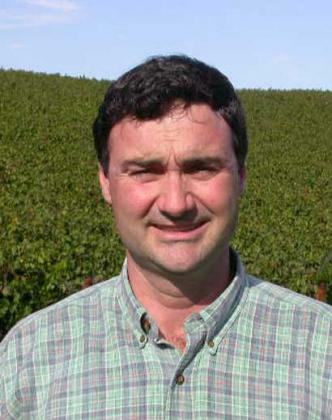 Craig Rous of Bear Creek Winery in Lodi has been confirmed as president of the 2007-2008 American Society for Enology and Viticulture’s (ASEV) board of directors. Rous will lead the 12-member board and build on the successes of Patricia Howe, the immediate past president. Michael Silacci of Opus One was also confirmed by the board to move to First Vice President.